Saturday, April 29, 2018 was a nice day in Illinois. A group of 24 railfans from the St. Louis Chapter NRHS, the Gateway Division NMRA, and friends met at the Gateway Rail Services shops in Madison, Illinois. 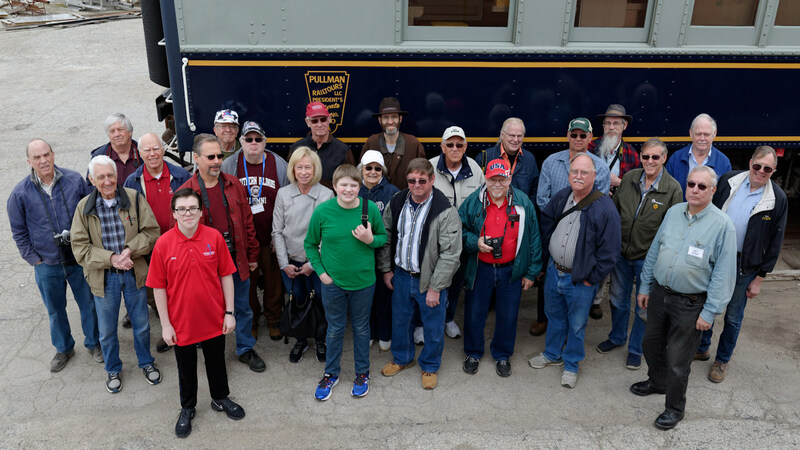 Roger Verbeeren, President, Gateway Rail Services, gave us an extensive tour of the rebuild shop, fabrication shop, wheel shop and some private rail passenger cars. He explained the process of rebuilding, remodeling and maintaining private rail cars as well as specialty cars for major railroads. Skilled craftsmen meticulously restore the cars. He also explained how government and Amtrak regulations have an impact on these cars. Roger also told us about the costs of certain jobs, regular maintenance and options the owners have in keeping their cars in passenger service. After going through the three shops, we were free to roam the facilities, examining the fleet of some 140 old passenger and baggage cars on storage tracks and take pictures. The tour made us aware that the cost of purchasing a passenger car is the least the owner will spend. Cost of maintaining and using the car runs very high. We asked many questions and Roger was patient and informative with his answers. It was a nice surprise for us to be given the baseball caps with the company logo on them. The tour was a great success! Thanks Roger for a Great Tour! View our gallery of 52 photos from the tour!